Shrimp and pasta in a creamy lemon butter sauce. A New Orleans tradition. Since 1889. Jazz up dinner tonight! Microwaveable. Try all the delicious, microwaveable meals from Zatarain's: Blackened Chicken Alfredo, Blackened Chicken with Yellow Rice, Dirty Rice with Beef & Pork, Jamb Alaya Flavored with Sausage, Red Beans & Rice with Sausage, Sausage & Chicken Gumbo, Shrimp Alfredo, Bourbon Chicken Pasta, Creamy Cajun Chicken. Partially produced with genetic engineering. Comments or questions? 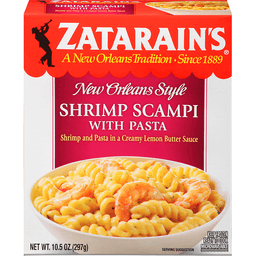 Call 1-877-837-3796 or visit us at www.zatarains.com for great recipe ideas and product information. Plastic tray contains 20% minimum post consumer recycled content. 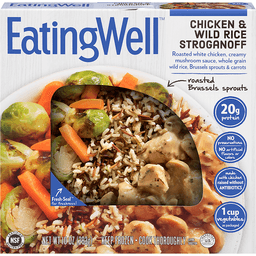 MICHAEL ANGELO'S GOURMET FOODS, INC.
Roasted white chicken, creamy mushroom sauce, whole grain wild rice, brussels sprouts & carrots. Roasted brussels sprouts. Fresh-Seal for freshness! 20 g protein. No preservatives. No artificial flavors or colors. Made with chicken raised without antibiotics. 1 cup vegetables as packaged. NSF certified gluten-free. Inspected for wholesomeness by US Department of Agriculture. EatingWell started out on a country road in Vermont. Our aim was to help you make sense of nutrition and cook delicious food made from simple, nourishing ingredients. Today our goal is the same, but we're doing the cooking for you! Fresh-Seal for freshness! 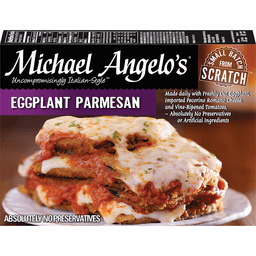 Our cool Fresh-Seal technology vacuums in the delicious flavors of this meal. For more information and inspiring meal ideas visit: EatingWell.com/frozenfresh. Facebook. Twitter. Instagram. We'd love to hear from you! 1-844-660-6200 (M-F, 8 am - 4 pm CT). You will love our Chicken & Wild Rice Stroganoff. Whole grain wild rice - a source of protein vital to Native American cultures for centuries - adds an earthy, flavorful complement to our creamy stroganoff and roasted Brussels sprouts. Excellent source of protein. So many delicious ingredients in this beautiful entree - see for yourself! Vacuum seal locks out oxygen to maintain freshness. Fresh-Seal film material is safe and easy to remove after cooking. Each meal is plated by hand. Tray and film are BPA free. Bellisio Foods - the beautiful foods company.